Someone save me from this spider! The cat was calm, I wasn't. I just HAD to grab the camera and snap a few. This pic has sent friends into hysterics. Comments for Someone save me from this spider! ALL THROUGH THE NIGHT, NOT A CREATURE STIRING, EXCEPT ONE LONELY SPIDER ,THAT NEEDED A FRIEND ,he he!!! That's something else and he or she just sat there, amazing cat! Thanks for sharing the pic, Tracy. I recognize that stare. 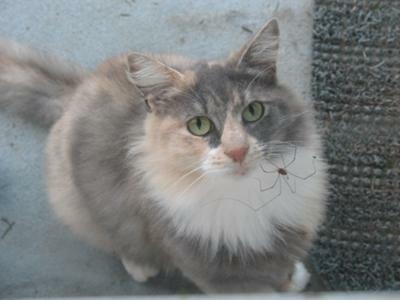 Based on the look on the cat's face, that spider's future looks questionable. Join in and write your own page! It's easy to do. How? Simply click here to return to Funny Cat Pictures.